Updated changed cake in mix to JF Yellow Cake. This is my version of a Ooey Gooey Butter Cake. I find it interesting to read the history on how a dessert came about, and just like most things in history, many different versions exist. 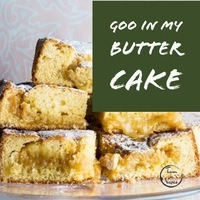 The Gooey Butter Cake originated in the 1930s. According to legend, a German baker added the wrong proportions of ingredients in the coffee cake batter he was making. It turned into a gooey, pudding-like filling. Whatever the true history, it is loved by many, their are many different versions, here is my version. Enjoy. This recipe is the property of TamVapes and released under the CC Attribution-ShareAlike 4.0 license. You may not copy, derive or commercialize this recipe without following the terms of this license or the explicit permission of the creator.